If you’re running Excel 2016 on a touchscreen device that lacks any kind of physical keyboard, such as a Surface 3 tablet without the optional Type Cover, you need to open the Touch keyboard and use it to input your spreadsheet data. To open the Touch keyboard, simply tap the Touch Keyboard button that appears on the right side of the Windows 7,8, or 10 taskbar. Doing this displays the Touch keyboard docked at the bottom of the Excel program window. To undock the Touch keyboard beneath the Excel 2016 program window, click the Dock/Undock button that appears to the immediate left of the Close button in the upper-right corner of the keyboard. The figure shows you how your touchscreen looks after undocking the Windows 10 Touch keyboard and dragging it up away from the Excel status bar. A Windows 10 touchscreen after displaying and undocking the Touch keyboard so it floats in the middle of the Excel 2016 program window. 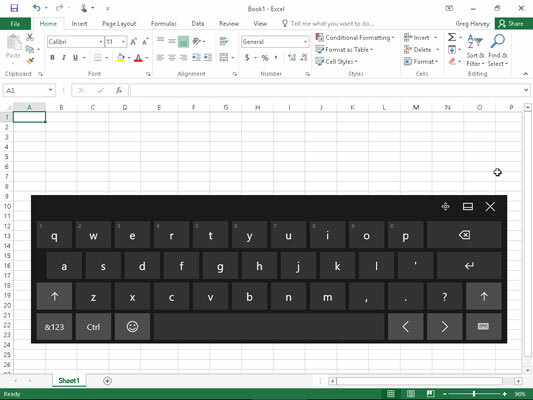 When you finish entering your worksheet data with your Windows Touch keyboard, you can close it and return to the normal full screen view of the Excel program window by tapping the Close button. The Windows Touch keyboard supports a split-keyboard arrangement that enables you to see more of the cells in your worksheet as you enter your text and numbers in the worksheet from separated banks of keys on the left and right side of the worksheet area. To switch to this arrangement, tap the Keyboard button in the very lower-right corner of the Touch keyboard and then tap the second-from-the-left icon with the picture of a keyboard with space in the middle from the pop-up menu that appears. Excel then displays the split-Touch keyboard with a version of the ten-key keypad in the middle of the keyboard and the QWERTY letter keys separated into a left and right bank. You can also switch to an Inking keyboard (the icon second from the right with a stylus sticking out of it) where you can make cell entries by writing your entries in the keyboard area with your stylus and then inserting them into the worksheet by tapping its Insert button.